For decades the Chinese People’s Liberation Army Navy, or PLAN, was essentially a third-tier, “brown water” force that was used principally for coastal defense and patrolling. But in the past two decades, as China’s economy has grown to become the second-largest in the world behind only the United States, it has steadily modernized its navy into a “blue water” force capable of projecting power globally. And now, the PLAN is working on the development of a naval vessel that, in the words of Popular Science, would be a “warship of naval theorists’ dreams,” an arsenal ship capable of submerging like a submarine. The Chinese navy is taking arsenal ships in a new direction—as giant submersibles. Post-Cold War naval theorists have long dreamed of recreating the old battleships’ power through massive “arsenal ships,” or warships carrying hundreds of guided missiles that could fire at land and sea targets. Now it looks like China wants to make that dream a reality. In the early 20th century, “dreadnoughts” — a generic name given to massive battleships after the Royal British Navy launched the first of its class, the HMS Dreadnought — eventually gave way to “super-dreadnoughts” and both classes were used in World War I & II. The principle armament of these ships were six-to-nine massive guns, but they also bristled with dozens of other gun calibers and types. The only remaining dreadnaught is the USS Texas, but the U.S. Navy refurbished four World War II-era Iowa-class battleships (USS Iowa, USS Wisconsin, USS Missouri and USS New Jersey) during President Ronald Reagan’s military build-up in the 1980s. The Missouri and the Wisconsin saw action in the first Gulf War; all battleships were retired (again) after that conflict. 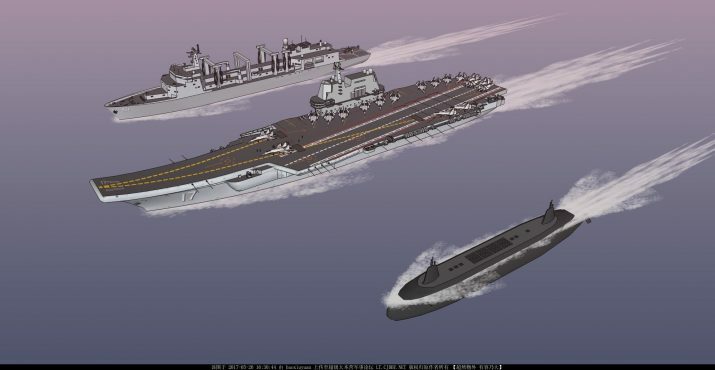 The Chinese concept resurrects the notion of a massive “arsenal” ship that also bristles with weapons, but not guns: The ship would be capable of carrying hundreds of guided missiles that could be launched against multiple targets simultaneously. The fact that the vessel could submerge means that it would be more difficult to locate and target. Being submersible — fully or even partially — dramatically reduces a ship’s radar signature. It would also protect it from most anti-ship missile threats (though not submarines). Stories circulating on Chinese websites, including one belonging to the Wuhan city government, noted that various China-based institutions are studying the concept of the gigantic submersible vessels. Two concepts have been seen, PopSci noted. One of them envisions a high-speed vessel with most of its hull under water, but it operates with a functional above-water superstructure featuring radar and defensive weapons. One major aspect: Both ship designs are massive; each would displace about 20,000 tons fully loaded, PopSci reported. According to reports, the Chinese have already put a substantial amount of work into designing a submersible arsenal ship. Leading naval engineer Prof. Dong Wei Cai worked right up until his death on a very important component of the ship, its high-speed wave hydroplane. A key operational function of the first arsenal ship design that the Chinese would eventually decide upon and build would be its ability to remain stealthy, and for that most of the ship’s hull would have to remain submerged, so as to reduce its radar signature. However, as the vessel sailed with a high-speed naval task force it would need to give up much of its stealth capability as it rises largely above the waterline to hydroplane across the waves. The second design is much more conventional — more like a massive submarine operating mostly underwater, with two conning towers visible. In order to keep up with the faster-moving surface ships of any task force, the second design would operate largely above water in transit, then submerge before combat operations were to begin, PopSci reported. Stay up to date with the truth at NewsTarget.com.